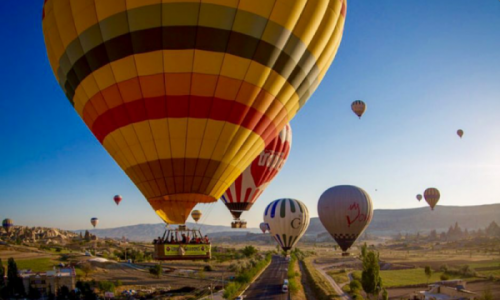 Cappadocia is known to be one of the best places in the world to fly with the hot air balloons and our Cappadocia Hot Air Balloon tour will entertain you at its best. The price of this tour includes the pickup from and back to the hotel, a delicious yet light breakfast before the flight, hot air balloon flight pre-sunrise, champagne celebration and to be awarded with flight certificate after landing. Flying over the landscapes of Cappadocia in hot air Cappadocia balloon is indeed an amazing experience. You will be enjoying an ultimate adventure of your life in one hour. 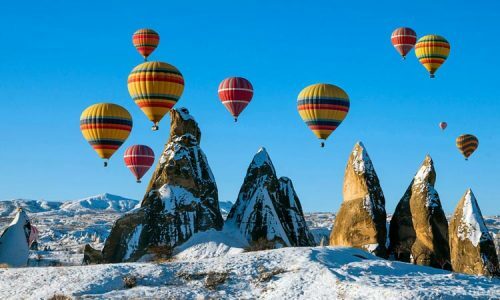 With this attractive and special Cappadocia balloon tour, you will be in a position to enjoy an aerial view of all the wonders around with ancient churches and fairy chimneys. To start with your Cappadocia Hot Air Balloon tour you will be picked from your hotel by our representative in VIP vehicles sharp at 05:00 a.m. You will be escorted to the Cappadocia balloon lounge in the early morning, to be more specific, during pre-dawn hours. When you will be tantalizing your taste buds with light breakfast, your flight certificates for the Cappadocia balloon tour will be prepared. These will be prepared for individuals. You will be entertained with tea, coffee, and snacks as your breakfast. It will be a kind of open buffet Turkish style breakfast. We will ensure that you will get a maximum of the local culture so why should we not take in the local taste to you as well. The preparations to take off the Cappadocia balloon ride will take around 15 minutes only. It is for sure an interesting sight. Just before the sunrise, our qualified and capable pilot will be checking the weather and landing area for the flight that he will consider to be appropriate. He will be making the last safety checks before taking off the Cappadocia air balloon. Also, he will be briefing you about your safety during the flight and there you are all geared up to fly high. The day will be dawning; balloons for your Cappadocia Hot Air Balloon tour will be inflating. Do not forget to bring your cameras with you because as the crew will be inflating the balloons you can take the pictures of the balloons and Cappadocia. Once the inflation is done, you will be warmly welcome to the balloons. This is it, you will be flying higher and higher in the sky, going up and up, your balloon flight actually begins here at this point of time and you are finally flying. We will go wherever the wind will take us. The sky layered with air currents will make the flight of our Cappadocia Hot Air Balloon tour smoother. At the same time, the pilot will be heating the air inside the balloon with the help of the burner in order to rise into and above the layers of the air currents with different directions. You will be enjoying the marvelous view of Cappadocia from above. You can also enjoy taking pictures of the sights around you. Moreover, our crew will be more than welcoming and willing to take your pictures in the balloon. The total flight time of the Cappadocia Hot Air Balloon tour will be one hour. We will be allowed to land on any of the many open fields in the area that we will be flying over. Our pilot will begin the descent in a gentle manner whenever he will find any appropriate landing site. This will be the point where we will be meeting our professional and experienced ground crew to take care of us. After packing the balloons, when you will be toasting and enjoying champagne after minimum an hour’s flight of your Cappadocia Hot Air Balloon tour at the launch point, for the memory you will be presented with the certificates. You will be cherishing the memories of this lifetime event for the rest of your lives. Afterwards, you will be transported back to your pick up points. This whole experience will last for around 3 to 4 hours and hence you will be left with enough time to enjoy visiting other attractions of the Cappadocia. You can also get dropped back to your hotel in our VIP vehicles, just in when it will be your breakfast time. 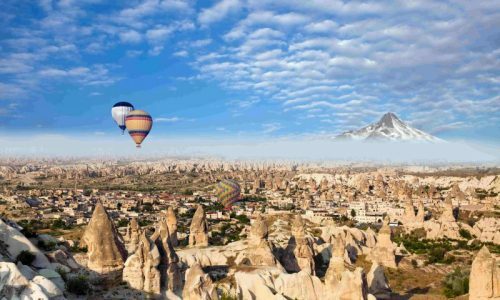 Enjoying this Cappadocia Hot Air Balloon tour will enable you to have a whole new set of adventure and experience that you will not be able to forget for the rest of your life. The perfect flying conditions combined with spectacular surrealistic landscapes enable the balloons to drift gently over and between the fairy chimneys, orchards, pigeon houses that are hewn into the rock formations that are unique in their own way, through impressive valleys, each of which have distinctive rock formations, features, and colors and last but not the least the beautiful vineyards. Float up over the ravine that ripples to enjoy and see breathtaking views all around the region from above. Allow us to facilitate you in making this dream turn into reality and see how professionally we will take care of the things. This one hour in the hot balloon will change the way you always used to think about entertainment, enjoyment, and adventure in every manner.